Nowadays superheroes are everywhere. There are superheroes with extraordinary powers. But some of the best superheroes are the average Joes who lace up their boots, throw on some leather, and go crack some skulls with their fists. These heroes made for the best stories. Perhaps that explains the success of both The Arrow and Daredevil. Both of these heroes have successful TV series. What is it about these two particular heroes and their shows that’s so intriguing? Both Oliver Queen (Green Arrow) and Matt Murdock (Daredevil) are vigilantes. Neither are part of a government sanctioned superhero team or a collection of privately funded heroes. These guys are regular dudes who are using their skills to go above the law. They aren’t licensed to hunt criminals. They are just as likely to be arrested by the police as the bad guys. That added element of danger is enticing. It’s also an element that is heavily incorporated into both show’s storylines. Both series offer a dark, gritty environment. This was especially true in the early days of the Arrow series. There are no adventures to exotic locations to save the planet. The central plot is always centered on saving the city or even something as small as the community. While Arrow does utilize some interesting locations, the premise is saving the city. This gives both shows a more ground-level and intimate feel. Instead of good versus, the conflict is a more personal affair. Escalating tension with personal stakes at play makes for a far more exciting showdown when the hero and villain finally do lock fists. Overall, Daredevil does offer the more tightly written plot. Daredevil’s story flows so well. You never get the feeling that you’re watching a filler episode, which has plagued the Arrow series. Every scene has a purpose and comes back into play later on in the series. The Arrow isn’t as effective with its storytelling. Of course it is on a major network instead of Netflix. Its delivery method is different and seasons are longer. With the popularity of the Marvel Cinematic Universe unfolding on the big screen, the idea of a shared universe had bleed over into the realm of television shows. Daredevil is part of the Marvel shared Universe but particularly Marvel’s collective Netflix shows. Arrow is also a part of a shared universe. He inhabits the same plane of existence as the Flash and their shared collection of sidekicks and super villains. We have seen The Flash several times on the Arrow series and likewise with the Arrow on the Flash show. While this isn’t as common on the Daredevil series yet, there are plans to crossover Daredevil with the likes of Jessica Jones, Luke Cage, and the martial arts superhero himself Iron Fist. Hand to hand combat is utilized heavily in both series to various degrees. Both heroes have had some form of martial arts or combat training and it is relied upon often throughout both series. Daredevil in particular has displayed an amazing array of martial arts goodness. The fights are gritty, bloody, and seem to grind on in a realistic cadence. Combat on the Arrow is more team centric and therefore more sporadic. Arrow also utilizes more long distance weapons such as handguns and bow and arrows. Both characters and their shows really reflect elements of the city in which they are set. Daredevil of Hell’s Kitchen New York City is violent, bloody, gritty, and raw. The main character is determined and stubborn, having overcome serious handicaps and obstacles in his personal life. Matt Murdock has an indomitable spirit that will not be broken. The Arrow, both the series and the main character, is mysterious but inclusive. Oliver Queen is resourceful, utilizing not only weapons but other organizations such as Queen Industries and the Police Force to his advantage. He has reluctantly formed a team of sidekicks around him that have become essential to the day-to-day operations of his super-heroics. 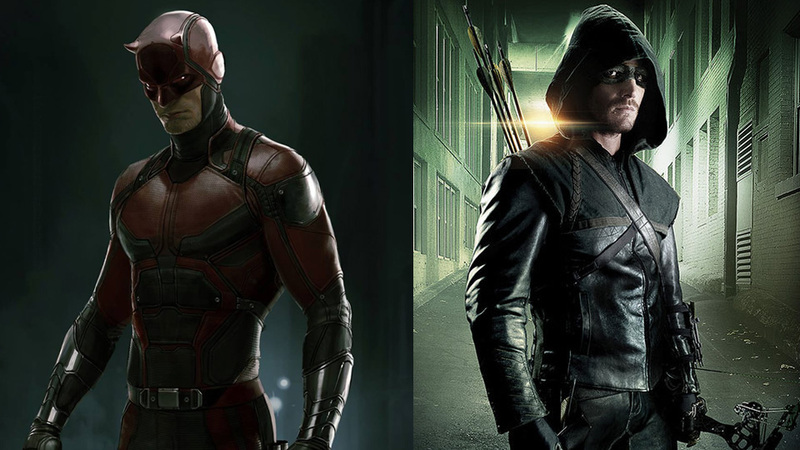 Both Arrow and Daredevil have an important supporting cast that is used in different ways. Matt Murdock seems to like to operate alone. He keeps his night time antics secret from his colleagues and friends, at least as long as he can. Even when some of those closest to him discovered his secret, they do not join in on the fun. Oliver Queen however, seemed to embrace cultivating a vigilante team around himself early in the series. Crime fighting has almost become a family affair as everyone close to Oliver has been clued in on his secret identity. Of course both the Arrow and Daredevil do have differing ideologies. The characters themselves represent completely different things. Arrow, in the beginning, was focused on rectifying the mistakes of his father. He wanted to save his city and wasn’t concerned with the ethics of how he went about doing it. In fact, unlike Daredevil, he has killed on several occasions. Daredevil does not believe in killing as a hero. The majority of Daredevil season 2 was based around the main character’s morals, as Matt Murdock had to reflect on his own actions as he confronted the brutal Frank Castle known as The Punisher. Of course Arrow stopped killing as the show took on a lighter tone. Daredevil and Arrow both have dapped into mysticism. Both heroes have had encounters with groups of ninjas. For Daredevil, he had battled the relentless ancient organization known as The Hand. The Arrow has had run-ins with the ancient organization The League of Assassins. Both of these ancient organizations have fierce ninja warriors trained for brutality and murder. It’s interesting that despite the differences of these heroes, their training, background, and the tones of their particular shows, both main characters have encountered ninjas. It’s also ironic that both have had love interests associated with these ninja-like organizations. If you like your superhero series with a lot of action, hand-to-hand combat, and a martial arts influence, Arrow and Daredevil are must see shows. Daredevil, being on Netflix, offers a more condensed story over a shorter amount of episodes. The Arrow is on the CW and has the standard 23 episode seasons. Because of the length of seasons, Arrow has fallen off a bit plot wise in recent seasons. This is something that cannot be said about Daredevil. However, the first two seasons of The Arrow are excellent. I dare to claim that they are some of the best seasons of any series produced on network television this decade. So you can’t go wrong being a fan of both of these shows. If you’ve avoided the hype of the superhero scene but you’re into martial arts and combat action, perhaps now is the time to give these shows a try.